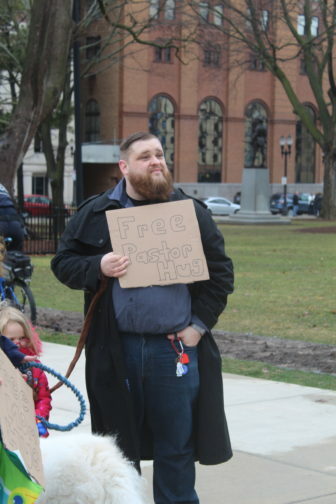 Mark Vorenkamp gives out “Free pastor hugs” at the rally. 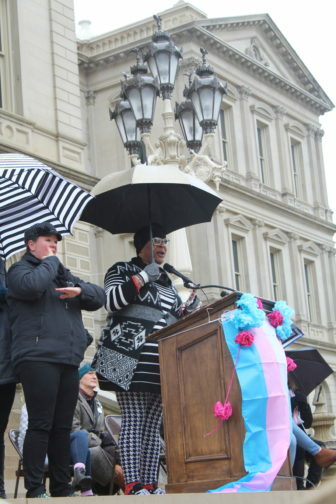 From the steps of the Michigan Capitol, Michelle Fox-Phillips yells, “We must say…Yes, I am transgender.” The International Transgender Day of Visibility crowd applauds. Fox-Phillips is executive director of the Gender-Identity Network Alliance. March 31 is dedicated to celebrating transgender individuals and raising awareness of transgender issues. The event was founded by Michigan activist Rachel Crandall-Crocker in 2009. Crandall-Crocker said Saturday’s rally was the first of its kind in Michigan and was set up by her organization, Transgender Michigan, which she co-founded with her wife, Susan Crocker. Crandall-Crocker says her group was assisted by the Lansing Association for Human Rights. “I wanted it to be an activist-centered rally,” said Crandall-Crocker. Thora Hanses drove from Royal Oak to attend the rainy rally. Hanses said she predates the word “transgender” in common speech. Hanses said that she came to the rally to be with her trans and nonbinary community. 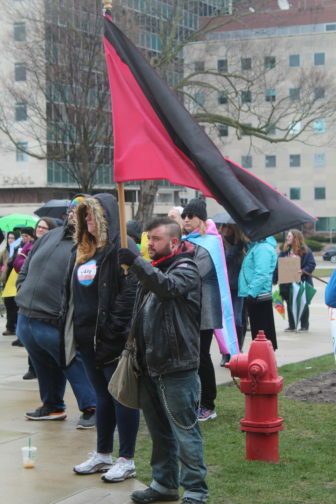 “I’m transgender, so I want to be out here with my community, but I also want to be representing anti-capitalism and anti-authoritarianism,” said Wilford. “I don’t believe that change can come from within the system,” he said. “I wanted to make sure that there was at least one person out here … that could show that God is love, Christians are loving, and God loves you just the way you are, and I love you just the way you are,” he said. Jeynce Poindexter stressed the importance of acceptance. Speakers included Jeynce Poindexter, priest Charles Blanchard and transgender activist Char Davenport. Poindexter is a founding member of the Trans Sistas of Color Project-Detroit and a board member of the Women’s March. She talked about the importance of trans people being accepted. Andrew Wilford bears his anarchist flag. Charles Blanchard, a Catholic priest and LGBT ally, also spoke. “My friends, and I count you as friends, thank you for participating in the process of positive change, I implore you to stand firm, fight the good fight, and always know: as long as I live, I will always be there and have your back,” Blanchard said. Imani Patterson is a Journalism major at Michigan State University. Her journalistic interests include music and entertainment. She has interned for Impact Radio and runs her own music blog. She hopes to work for Billboard magazine or Rolling Stone. The Delta Township District Library is offering an implicit bias identification program as part of Capital Area Reads 2019. The program was led by Trina Rios.